The epitaph on this headstone took my breath away. In the still morning air, the the loss this family endured was almost palpable. 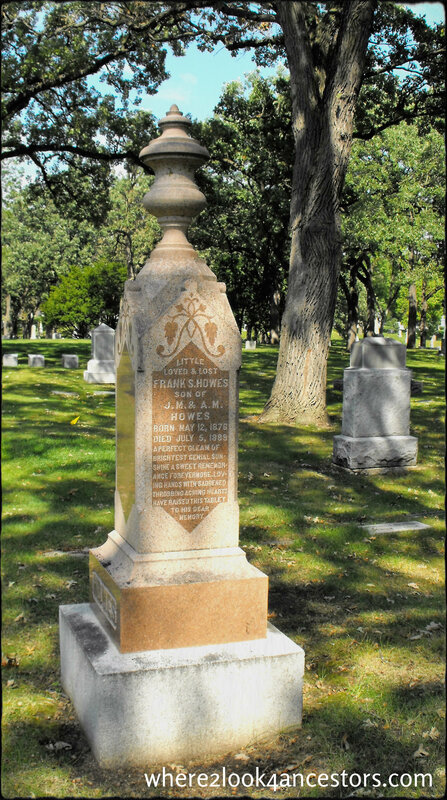 Frank’s headstone is surrounded by large trees in a lovely section of Lakewood Cemetery in Minneapolis. Oh my! How moving and emotionally written! That’s an outstanding stone. It is beautiful, isn’t it? After reading Jim’s comment, I’ve been doing a little research on the Howes family. Can’t wait to share my findings – stay tuned! The records indicate that his father J. M. Howes dies shortly after. Little Frank died July 5, 1889, J.M. died Sept. 17, 1889. I wonder if he died from a broken heart or if he found that he could not live with his grief. Frank’s mother Anna had died in 1881. Just tragic, isn’t it? Anna is listed on one side of the larger monument here. You’ve made me curious Jim! I’ll see if I can find Jason’s cause of death and let you know.